We are trying a new format this week on the blog: a summary of the last three months in real life and on the blog. As we not only posted about current travels, but also did some blog posts on the UNESCO sites we have visited longer ago, it may not always be clear from the blog posts where we are right now, or where we have been recently. It might not look like this, but after a longer Central Asia trip in June we spent the better part of the summer in Berlin working on two different guide books (Central Asia and Japan), only interrupted by 16 days of wonderful hiking and sightseeing in Switzerland. We also did do some sightseeing in Berlin, though: for example, we joined a tremendously interesting tour through the building of the Ministry of Finance (another blog post for the future) on an open door day. We also met a lot of friends, went to the climbing gym twice a week and even managed to rent a kayak for half a day. And most of this was possible because of the ongoing sunny weather. Natascha has meanwhile left for Kyrgyzstan and Tajikistan for tour guiding work – a looong tour of 24 days going from Bishkek via Uzbekistan to the Pamir Highway. And here comes a round-up of the last three months of blogging on WESTWARDS. We love to hear your opinion and answer any questions you have regarding our travel destinations. Have a wonderful autumn and for all of you in Europe an easy transition towards winter. We travelled there for the first time in early summer 2015. We had wanted to go there for years and this year we went as a prelude to our research trip in Central Asia. We went through Turkmenistan on a five-day transit visa (the only affordable way to travel there) in June, entering from Iran, exiting to Uzbekistan. Our main reason for this trip was guide book research on some ancient sites. Old Nisa – what is left of the old Parthian town? We spent 8 days in Uzbekistan in June, mostly to catch up with business partners and friends as well as to research a few new hotels. And we managed to visit some out of the way sights. The interior of the cupola is covered in colourful tiles that form a complicated net of stars and geometrical figures. Every sector within the net is filled with a different pattern – and the design is full of surprisingly diverse details but still a perfect unit. The cupola of the Turabeg Khanum mausoleum in Kunya Urgench is about 700 years old and might very well be Central Asia's most beautiful cupola (we have seen many). We are on the fourth day of our five day transit visa through Turkmenistan and have already travelled in a shared taxi since early morning. Conveniently, the road from Ashgabad went through the desert most of the time, so there wasn't much in the way of distraction except for a short break at a road-side inn, where everybody ate meat pies and we ate vegetarian m&m's (meat pies being the only dish available). Once out of view of ever-watchful Ashgabad policemen and militia, the driver and some of our fellow travellers spent the ride smoking (which is forbidden in Turkmenistan). We were quite glad when the tall minaret of Kutlug Timur, the husband of the above mentioned Turabeg Khanum, came into view and we could get out of the smoky car. Kutlug Timur was a 14th century Mongolian governor and the minaret and a couple of domed tombs are all that is left standing of his once mighty city. Kunya Urgench means Old Urgench (there's a newer town by the name of Urgench now over the border in Uzbekistan). But back then Kunye Urgench used to be just Urgench, and it was the capital city of Khorezm. Its heyday was in the 9th and 10th century, before the Seljuks, when Mamoun II, an assiduous ruler keen to prove himself devout, civilised, enlightened, and praiseworthy, invited the top scientists of his day to his court. Scholars well-known to this day, like Ibn Sina (Avicenna) and al-Biruni once lived in Urgench. In the 12th /13th century regional rulers took over again, and their architects and craftsmen developed buildings and decoration styles that were new and beautiful. Unfortunately, one of those rulers picked a quarrel with Genghis Khan which ended in the whole of Central Asia being laid to waste. Urgench itself was flooded in 1221. Literally: the Mongols destroyed a nearby dam. Since it was a convenient spot, however, the Mongol rulers later rebuilt the city, complete with their own beautiful buildings – the tall minaret and the mausoleum with the beautiful dome stemming from this time. In 2005 the remaining buildings of Kunye Urgench became inscribed as a UNESCO World Heritage site. In Turkmenistan we have also visited the UNESCO sites of Merv and Nisa. Is it worth going to Kunya Urgench? Absolutely! As we mentioned, the Turabeg Khanum mausoleum has the most beautiful cupola in the whole of Central Asia, and the Kutlug Timur minaret also is an eye-catcher. Strolling through the desert from one mausoleum to an old graveyard and on to a minaret stub while imagining the mighty city of Kunya Urgench was a very special experience. If you are interested in Islamic architecture you will love it. As there are very few tourists in Turkmenistan and the Turkmens come here mainly to visit the tombs of some holy men you will be on your own most of the time. The ruins of ancient Urgench (Kunya Urgench) are situated about 1.5 km south of the town of Kunya Urgench. If you are in Turkmenistan on a transit visa, it is best visited from Kunya Urgench. Coming from Ashgabad, you can get off the bus or shared taxi directly at the site. With a tourist visa you will have a driver and organized transport anyway. Visiting the whole site takes two to three hours. At the turn-off to the archaeological site of Nisa in Turkmenistan, there is a small hut where the caretaker, a friendly old man with only one tooth as far as we can see, sells the admission tickets. It seems individual tourists are rare – he invites us for a cup of green tea and from one of the desk drawers he even produces some chocolate (the temperature was around 36° C!). From the hut it is still a 1.5 km walk to the ruins. Nisa was a town since the Parthian era (3rd c. BC) and abandoned in the middle ages. The famous trade routes of the Silk Road ran through Parthian territory, and the Parthians earned good money from taxes on the merchandise, as well as from the infrastructure they provided for the traders, such as restaurants, caravanserais, stables and guides. The Parthians were also famous and brave warriors who clashed with the Roman army several times. Their speciality was the so-called „Parthian Shot“ – a trick involving a feigned flight. When the pursuing enemies least expected it, the "fleeing" mounted archers would suddenly twist back in full gallop and shoot their arrows backwards. Archaeologists are still debating for what purposes Nisa was actually built. It might have been an early capital town of the Parthians or a ritual mourning place for the dead Parthian kings. There is a round course you can (and should) follow, but no further explanation. Since 2007, the two archaeological hills of Old and New Nisa have been included in the UNESCO World Heritage list. The town walls are still impressive (albeit ramparts rather than brick walls these days), and some of the excavated buildings have been partly restored. Otherwise, you mostly see crumbling adobe walls and corridors, some pillars. To see temples, audience halls, a domed round hall and pillared square buildings, you need quite a bit of imagination (and a guidebook, perhaps). Do you think you would enjoy a visit to Old Nisa? In our opinion, yes. But then we love everything remotely connected with the historical Silk Road and Central Asian historical sites in general. If you go without a guide, you will need a good description to get the grip of the layout. Try to find Mr. Batia, who can open a small "museum“, actually just a room with a useful model of Old Nisa. He can also explain about the site (only in Russian). Nisa is situated around 18 km to the west of Ashgabad. We went there by taxi from the city centre (15 Manat one-way) and found a public bus for the way back into town, which took more than one hour, but was much cheaper (0.30 Manat per person). When we enter the museum in the town of Mary (the modern city near the ancient Merv), a whole platoon of soldiers is waiting in the archaeological section for a guided tour. "Too many men in that room", we are told and advised to start with the ethnographic exhibition instead, which turns out to be quite interesting, too. In the archaeological hall, we then opt for a guided tour as the written explanations are extremely limited. The guide shows us Zoroastrian cult objects and priests' sceptres. The Zoroastrian priests used to drink some intoxicating liquid with a kind of straw in their ceremonies, and had decorated stands specifically to put the straw. And of course, the museum also houses a number of stones and decorative elements from the ancient city of Merv. Merv is the oldest of the oasis cities on the Central Asian Silk Road, dating back as far as the 3rd millennium BC. The Bactria-Margiana region in today's Turkmenistan, Uzbekistan, and Afghanistan, was one of the earliest centres of agriculture and sedentary life, where the first Neolithic settlements appeared nearly 8000 years ago, and Bronze Age culture thrived from about 2400 BC. The archaeological site of Merv consists of several separate settlements from the Bronze Age onwards – the most important one being the mediaeval capital city of the Seljuks in the 11th to 12th century. In the city's heyday, this must have been a pleasant oasis watered by a delta of the Murgab River, but today Merv is a desert area with archaeological excavations and a few ruins and restored buildings looming over the sand. As the information given in our guidebook is (again) not very comprehensive, we are looking for a guide to visit the archaeological area. We are approached by a man who offers us a tour and dwells lengthily on his knowledge of the history and the place – but some sceptical questioning quickly reveals that he neither knows anything about history nor does he speak much English. The museum staff advise us to hire a guide directly at the excavation site. Yet, while we do find a taxi driver to bring us there – Mohammed, who doesn't speak English and knows nothing about history either but offers his services at a very fair rate (2 USD per hour) –, no guide, or even explanatory panels are to be found in ancient Merv. We are lucky to be able to buy a small but quite detailed booklet about the city's archaeological remains, written by one of the archaeologists working there, and proceed to explore the remains chronologically. Conveniently for the archaeologists, the rulers of each epoch started to build a new city right next to the old one, so that the researchers today don't have to decide which period they are going to destroy in order to dig out another one. Each of the cities is surrounded by high walls – those of big and small Kyz Kala, fortresses from the early Arabic period, still stand high and impressive, with defensive battlements and crenels. The oldest city was Erk Kala, built in the Achaemenid period (6th–3rd century BC). Its mud brick walls are worn down to broad ramparts, but are still clearly visible. Given the period, Merv had to be a "walk to work" city, as our booklet describes it: the city area is about 2 km square, just small enough to navigate on foot. The whole archaeological site, however, is quite big and we are glad to have the car to bring us to the enormous Sultan Sanjar Mausoleum, the 27 m high tomb of the most important Seljuk ruler who died in 1157. It is one of the main attractions, recently restored and partly reconstructed by Turkish archaeologists. Finally, we follow the guidebook to hunt down some minor attractions, such as the Mohammed ibn-Zeid Mausoleum. Mohammed, the driver, doesn't know these places although he grew up in the area, but eagerly takes note of the names – it may come useful for future tourists. Although, admittedly, individual tourists were (when we visited in 2006) and are still a rarity in Turkmenistan, as the only type of visa allowing tourists to visit individually is a transit visa. The State and Cultural Park "Ancient Merv" became a UNESCO Heritage Site in 1999; it is the oldest and most completely preserved one of the oasis cities along the Silk Roads in Central Asia. Turkmenistan is one of the least visited countries in the world, although it has a rich and varied history. The main difficulty is obtaining a visa. The ancient town of Merv is quite spread out and in order to get out most of the ruins you need a good guidebook, non-fiction book or a knowledgeable guide. With this, it's a very impressive and fascinating place. Merv is situated about 30 km from Mary. As there is no public transport, you need to hire a taxi to bring you there and drive you around if you aren't on an organised tour. We paid 2 USD per hour for a Russian speaking driver (this was back in 2006). Want to visit with Natascha as a guide? Check our planned tours as tour guides at "Reiseleitungen" for Silk Road tours that include Turkmenistan. Occupying a full square meter in the cupboard-sized office, Mr. T.’s photo looked kindly down on us when we collected our transit visa. It was our fifth visit to the Turkmen embassy. “Next Friday 5 o’clock,” the officer had grunted ten days ago, when we had finally been allowed, on our third visit, to enter the embassy compound and had handed in our visa application. We would see more of Mr. Turkmenbashi soon. 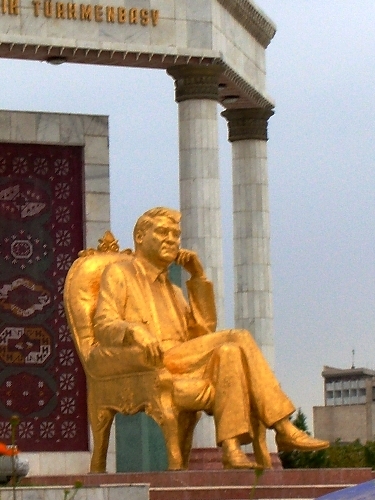 “Turkmenbashi”, or “Leader of all ethnic Turkmens” is the name adopted by Saparmyrat Niyazov after he turned President of independent Turkmenistan in 1991. Before that he had already ruled the country for six years – under Soviet guidance, namely as General Secretary of the Communist Party of Turkmenistan (CPT). When the Soviet Union fell apart, he simply renamed the CPT in “Democratic Party of Turkmenistan”, banned all other parties and tightened his grip on the country – this time without superiors in Moscow. Although Turkmenistan consists mostly of desert and has a population of only about 4.5 million people, it is a rich country: rich in oil and gas. At 0.02 Euro at black market rates, petrol is ridiculously cheap. The official currency is the Turkmen Manat, which is artificially strengthened by a fixed exchange rate of five times the black market rate. Foreigners have to pay hotels and train / ship tickets in Dollars using the official rate: a hotel room priced at 12 USD in Manat costs 50 USD for foreigners. This fictitious exchange rate has the effect that in official statistics, Turkmenistan’s per capita income appears relatively high compared to the low food prices in the region (but of course the bazaars operate on the black market rate, and spending power is only a fifth of the official figure…). As we had heard and anticipated, police and military are omnipresent in Turkmenistan. In the centre of Ashgabad, police and militia are positioned about every 10 meters. Taking photos of government buildings, or even of the private residences of the president, is strictly forbidden. At frequent road controls (at least every 100 km), we had to show our passports for “registraziya”. On the other hand, curiosity often broke the ice and the language barrier when our fellow travelers in shared taxis thumbed through our passports, showed their own birth dates and compared everyone’s photos. “I’m the oldest”, Annagul (36) cried and demanded the front seat – but she soon returned to us on the back bench out of concern that it would not be appropriate to have Muhammad sit next to us. During our stay in Turkmenistan Mr. T. followed us around the country: His photos and wall paintings adorned all government buildings, and numerous Mr.T.-statues populated the public parks. He seemed just as friendly as everyone else, incessantly smiling, and with those wrinkles in the corner of their eyes. Hadn’t the personality cult itself been so creepy, we might have taken him for a benevolent ruler eager to achieve the best for his people. “Turkmenbashi schön, ja?”, asked Kurban, a fellow passenger, who had learned German at school, and winked at us. We were not sure whether he had really asked if we think Mr. T. “handsome”. After all, Kurban seemed to be interested in politics. Cautiously we only indicated amazement that Mr. T. looks so young in the pictures. Later, Kurban told us that he was an officer and had once shaken Mr. T.’s hand. At the latest on the fourth day of our 5-day visa we had to be in Turkmenbashi, a town which Mr. T. renamed after himself (it used to be Krasnodarsk) to catch the unscheduled ferry to Baku in Azerbaijan. While waiting for the ticket office to open, a Turkmen businessman showed us the background picture on his handy, a pre-set image of Mr. Turkmenbashi.